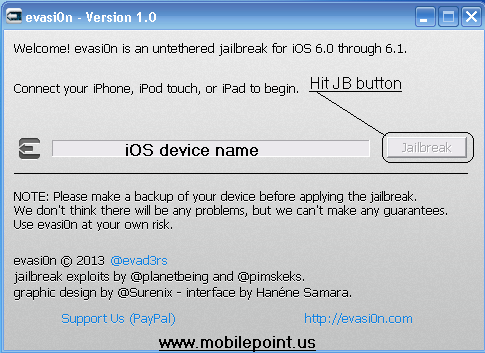 Finlay Evasion jailbreak team release iPhone, iPad, iPod, 6.0, 6.0.1, 6.0.2, 6.1 Untethered Jailbreak tool Evasi0n provide first time jailbreak solution. Here we added 6.1 jailbreak tool (Evasi0n) & jailbreak procedures for how can jailbreak iOS 6.1, 6.X series. Here evasi0n main software on you get your iOS device name then Hit the Jailbreak button like photo. Note: Make sure you need previous data that's for data backup its your self. Make sure Click Jailbreak button before look is it listed support device or 6.X series firmware?